Two creatures, a monkey and a bear, have just escaped from a life of captivity. As the creatures emerge into a world that is unfamiliar, they cope with their transition in divergent ways. 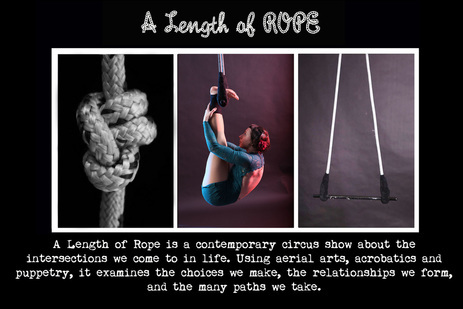 This tension is embodied by the distinction between the show’s two primary circus disciplines (slackwire and trapeze). One creature ascends into a world of myth and madness while the other treads a line of reality and human socialization. The two creatures try to maintain their connection to each other as their paths diverge, ultimately watching their bond unravel until a single string remains. Inspired in part by the contrast between lightness and darkness in the Alaskan winter, this show brings light to the stage through shadow puppetry integrated with circus arts. A System of Strings occupies traditionally unused spaces in the theater, starting in the lobby and ending among the rafters, creating an immersive experience for audiences. A System of Strings is a contemporary circus show created and performed by multidisciplinary American circus artists Ariel Schmidtke and Esther de Monteflores. The performance fuses shadow puppetry and physical theater with traditional circus arts including trapeze, wire walking and acrobatics. Music for the show is from Joanna Newsom's album Ys, and much of the performance is inspired by the story this album tells. The show is one hour in length and, though not specifically geared towards children, is suitable for audiences of all ages.